Weekly shopping lists, sample menus and recipes from BeingBrigid.com. Recipes feature nutrient-dense whole foods that are free of added sugar, gluten and dairy. We provide you with a full month of workouts you can do anywhere. No equipment needed and for all fitness levels. Workout sessions 3x/week and morning 5 sessions 4x/week. Post questions and engage with the community in a closed Facebook group. Access exclusive weekly videos and member giveaways. Join Brigid Titgemeier, Daniel Urcuyo, Julie Foucher, and a community of over eight thousand particpants for a FREE 28 day kickstart to nourishing your body with real food and movement. It is always the perfect time to commit to revitalizing your health, and we’re here to help you along your journey. 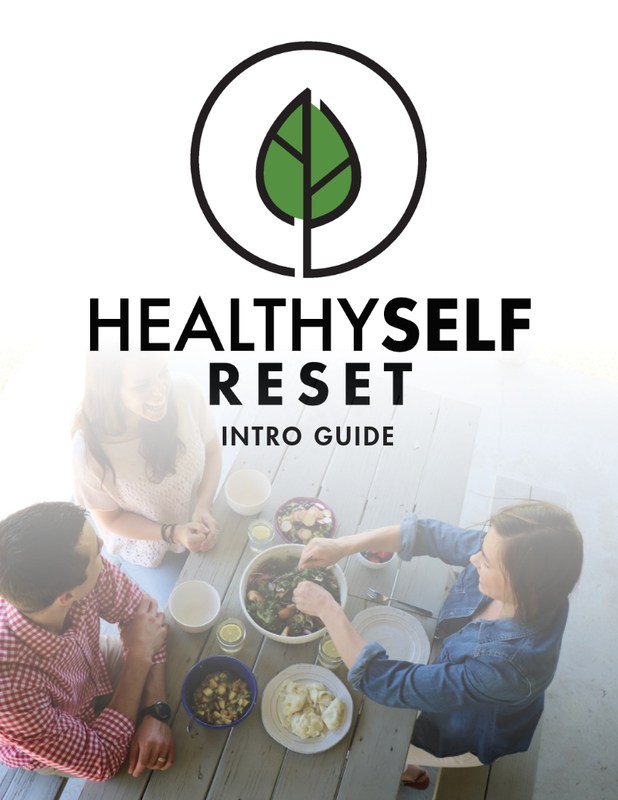 Sign up to receive everything you need for a FREE 4-week comprehensive reset! This reset has been life-changing. I feel healthier, and have had improvement in my hypothyroid symptoms- proven by my recent blood tests! (My doctor even called to check in and see what I had done differently!) I’m eating delicious food that I’m excited about- no desire to cheat 99% of the time. This program has helped change my relationship with food in a powerful way. I was an obese child; I struggled with disordered eating in my late teens through early 20’s; I struggled with body dysmorphia and my relationship with food since competing in Figure in my late 20’s. I finally feel like food can be healing, nourishing, enjoyable, and comforting without guilt. I am so grateful to everyone involved. I would not have tried paleo without this opportunity, and now I see this as my new lifestyle. You’ll be amazed at how great you can feel from cooking more at home, cutting out processed foods, and experimenting with new recipes. It’s everything that your body needs to achieve optimal wellness! 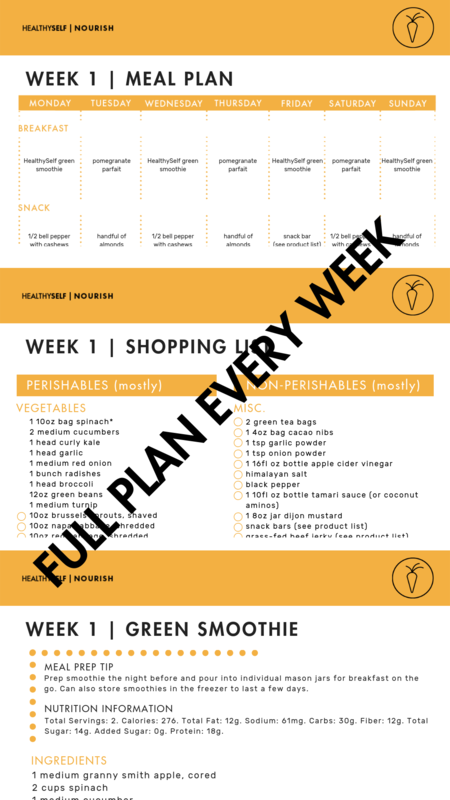 Full cooking plan, recipes and grocery list for the week Recipes that that focus on nutrient-dense, fiber-rich plants; clean meats and legumes; nuts and seeds; and healthy fats. Lifetime use of recipes. 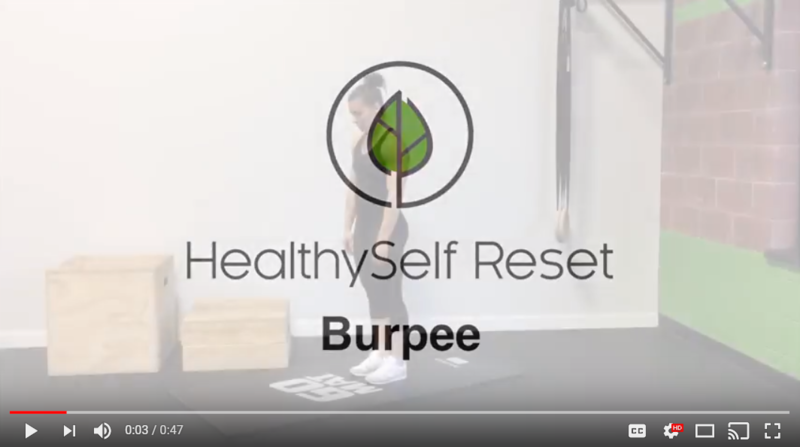 3, 30-minute bodyweight workouts & 4, 5-minute morning sessions each week Warm-up stretches, a main workout, & cool-down stretches Custom timer to keep you on track Scaling for all levels No equipment needed Videos with step by step instructions on how to perform functional movements. Recommended Products & Services Resource Library filled with recommended books, videos, blogs, products, services, and more. Exclusive member discounts, guides, shopping tips & more. 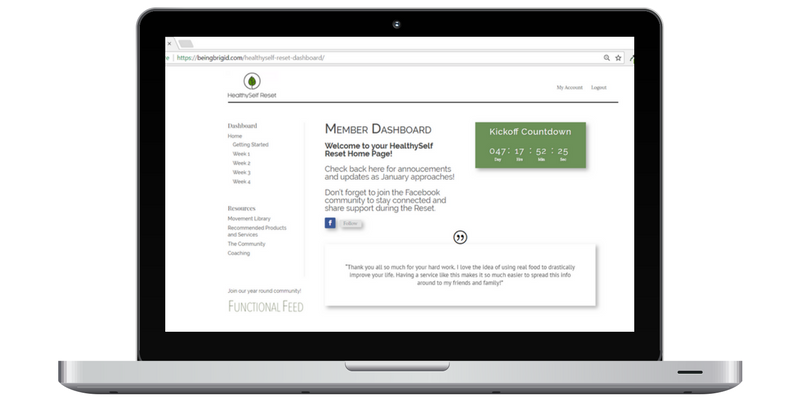 All content is on your personal online dashboard so you can keep everything in one place and printable to keep forever! Login to the member portal via desktop, tablet or smartphone for 24/7 access to all resources, meal plans, workouts and more. All content is on your personal online dashboard so you can keep everything in one place and printable to keep forever! Julie, Brigid and Dani have experienced first-hand the impact that nourishing their bodies with real food can have on their health. This has led them to team up to share their passion with you so that you can harness the power of a food-first approach to experiencing your healthiest self. Nutrition is very individual and personal. Some individuals may need more protein due to high intensity exercising, some may opt for a vegan diet, and others may have food allergies to ingredients we use in our recipes. While we try to provide a well rounded meal plan, please keep in mind that this is also not a one-size-fits-all plan. We will provide substitution recommendations when possible, but we recommend posting questions in the Facebook community so that everyone can see your question and the responses. What if I am very active or an athlete? What if my local grocery store does not carry a product needed in the recipes? We understand that accessiblity may be an issue. There are great online resources like Amazon and Thrive Market that can ship products directly to your door. If you in a country where certain products are not available, ingredient substitutions can be made. You can find many by searching online or you are welcome to ask in the Facebook group and we will help where we can. What if I live outside of the US where certain products are not available? We understand that accessiblity may be an issue. Amazon may be a good option if international shipping is available. If you in a country where certain products are not available, ingredient substitutions can be made. You can find many by searching online or you are welcome to ask in the Facebook group and we will help where we can. When will the following week documents be posted? Meal plans and workouts will be posted Wednesdays the week prior. What are the guidelines for eating out? We recommend steering clear of the ‘foods to avoid’ when eating out, however this is about progress and not perfection. sensitivities. It’s not encouraged to avoid these foods forever but the goal is to remove them from your system and then mindfully reintroduce them after the 28 days. You may identify symptoms after reintroducing these foods and it will be up to you to determine what works best for you after the initial 28 days. your diet during the HealthySelf Reset. Reducing added sugar intake is single handedly one of the best changes that everyone can make to improve their health. What if I am cooking for more than one person? The meal plans are meant to serve one so you may want to double or triple if you are cooking for multiple people. Refer to the number of servings per recipe and divide accordingly to figure out how many batches to make to have enough for everyone! Yes! (We know, what a relief!) Just make sure that if you use any creamers or additives, to make sure they are HealthySelf Reset compliant. The Healthy Reset program was absolutely incredible. I had been wanting to go gluten/sugar free for a while to see how it affected my inflammation in my sinuses and joints. That’s easier said than done with the state of most food that is readily available. The HealthySelf Reset taught me so much about gluten/sugar free nutrition and that is as valuable as almost anything. Reducing sugar intake has such an amazing impact on people’s overall health and anything that can be done to push that information on the public is fantastic. It’s always more fun together. Recruit your friends and family to join in! It was by far the best eating program I’ve ever done. The recipes and prep time were easier than anything I’ve ever done; which, in my opinion, made me stick to the plan better. Despite the recipes being easy and relatively fast, flavor and variety was not sacrificed. PS. this plan also brought my wife’s cholesterol from “high” to “normal”. This program was amazing. It took all the thought and stress out of eating healthy and living balanced. The support of the community was motivating and inspiring and allowed me to stick to the program. I got to put my wedding rings back on… thank you so much to all who put this together! 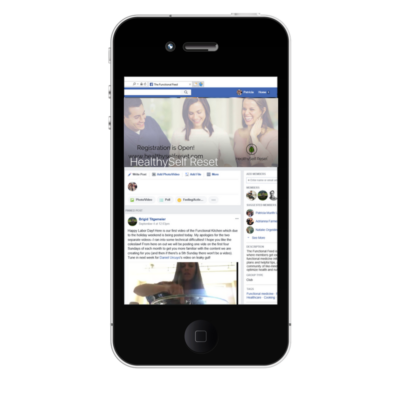 The HealthySelf Program was developed by a team of Medical Doctors and a Registered Dietitian Nutritionist to share their passion for functional medicine, nutrition, and fitness. Their mission is to empower individuals to become the healthiest and happiest versions of themselves. Philosophy: We believe everyone can be the healthiest version of themselves by living a functional lifestyle. This requires reliable information and resources on how to nourish the body with whole foods, maximize the ability to move, and address underlying causes of disease. Our unique functional lifestyle perspective incorporates functional medicine, movement and nutrition. We are a creadible team consisting of a Registered Dietitian Nutritionist and Medical Doctors trained in functional medicine & nutrition. We provide forums that provide direct access to ask questions and engage with a supportive, like-minded community.